Why is pollution from U.S. manufacturing declining? Summary of: Why is Pollution from U.S. Manufacturing Declining? The Roles of Environmental Regulation, Productivity and Trade. Shapiro, J. S. & Walker, R. (2018). American Economic Review. Air pollution from U.S. manufacturing has declined significantly since 1990. Between 1990 and 2008, the industry’s air pollution decreased by sixty percent. Emission levels of regulated air pollutants, like nitrogen oxides, particulate matter, sulfur dioxide, and volatile organic compounds, fell by an average of 35%. This reduction was not caused by a decline in the size or productivity of the manufacturing sector itself; in this same time period, there was a substantial increase in manufacturing output, with the value of manufacturing output growing by one third. Our study examines the cause of this decrease in pollution and finds that it can be traced to changes in environmental regulation of pollution. There are three possible explanations for the decreasing pollution levels. First, overall productivity improvements in U.S. manufacturing may drive pollution reductions; as firms use fewer inputs to produce the same level of output, overall emissions could fall. Second, if manufacturing shifted over time to manufacturing products that are less pollution-intensive, the pollution impact of the industry might decrease. This could happen, for example, due to changes in importing and exporting of manufactured goods. Some industries, like steel and cement, are higher polluters. If these products were increasingly manufactured abroad rather than domestically, the pollution impact of U.S. manufacturing could decrease. Third, if manufacturing changed production methods to emit less pollution for each product manufactured, these individual changes would lead to an overall pollution reduction. For example, regulation-induced pollution abatement technology could reduce the pollution impact of each manufacturing process. What caused air quality improvement? We used administrative data on manufacturing output by plant, product, and year between 1990 and 2008 from the Census of Manufacturing and the Annual Survey of Manufacturers. We combined this with data on pollution from the EPA National Emissions Inventory and Census of Manufacturing. These data allowed us to break down the overall change in emissions into the three possible explanations: change in scale, change in composition of production, and change in production technique. We also developed a quantitative model for firms’ decision-making about pollution output. Combining this model with historical data allowed us to explore various historical counterfactuals, turning on and shutting off various explanatory channels. Examining historical data on pollution and production shows that changes to scale and composition of production did not cause most of the observed emissions reductions. The overall composition of the U.S. manufacturing industry has not moved significantly in the direction of producing cleaner types of products. Our data shows that technique changes, or changes in the pollution levels of specific products, were responsible for the pollution decline. If these pollution reductions within industries had not occurred, emissions would have risen by 20 to 30 percent instead of decreasing. Several economic forces could have caused these product-level improvements in emissions intensity. For example, changes in trade costs, such as NAFTA, could have led to industry reallocation to more productive firms, which also have lower emissions intensities. Alternatively, more strict environmental regulations could have caused the reductions. To determine the underlying cause of the reductions, we constructed several counterfactuals to understand the individual effects of economic forces. First, we examined the effect of foreign competition and found that it did not contribute to the emissions reductions. If all other factors besides foreign competition remained unchanged, there would have been a small increase in pollution rather than a decrease. Part of the reason import competition did not explain emissions improvements is because imports are not concentrated in high-pollution industries. Next, we examined the effect of U.S. competition, and again found that holding all other factors constant, changes to U.S. competitiveness over this time period would have caused pollution emissions to increase. The only factor that was found to reduce emissions was changes in environmental regulation. In the early 1990s, environmental regulation accounted for 90% of the observed pollution reductions, and by 2008, it accounted for virtually all of the reduction. This figure plots the observed and counterfactual trends in emissions for six pollutants based on our statistical decomposition. The solid lines plot the counterfactual - what emissions would have looked like in a world with the same composition of good and techniques of production that existed in 1990. The dashed lines represent what emissions would have looked like if we maintained the same productions techniques as 1990. The dashed-dotted lines represent the actual observed emissions trends, which consist of changes to scale, composition, and productions techniques that occurred since 1990. Source: NBER-CES database, ASM, and NEI. Our work provides clear evidence for the effectiveness of environmental regulation in reducing pollution emissions. 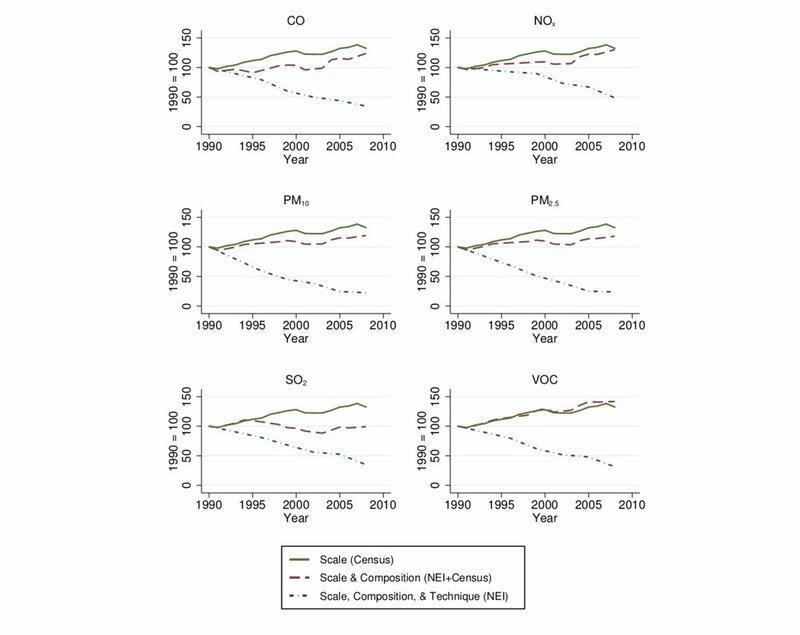 Almost all the air quality improvement that occurred between 1990 and 2008 can be attributed to regulation-induced reductions in manufacturing pollution emissions. Rather than studying a specific policy change, our work observes the combined effect of all pollution regulation in this time period. Our modeling shows that the effective “price” of air pollution for manufacturing firms doubled between 1990 and 2008 due to enacted regulations. In contrast, the “price” of CO2 did not change in this time period. Our work shows that environmental regulations, such as the Clean Air Act, succeeded in improving air quality, while still allowing U.S. manufacturing output to significantly expand.